Norris fell in love with football at the young age of seven. But, while he worked extremely hard at chasing his NFL dream, his story is not about football. His story is about the one BIG decision that would fuel ALL of his life decisions going forward. His seven-year-old self said he was going to make it to the NFL one day. And, by reaching that dream of playing NFL football, he believed it would ultimately lead to meeting his father for the very first time. The goal of finally getting to meet his father defined the “why” for Norris. 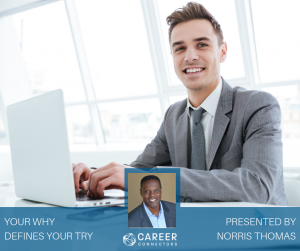 Norris explained how your “why” has to be HUGE. If your why isn’t big enough, then your “try” has to be even bigger. Your “try” is effort and hustle. It’s when we’re at our best and what people remember the most about us. For job seekers, it’s about branching out and thinking about deployment instead of employment. A strong commitment to the “why” in Norris’ life led him on a journey from a homeless shelter as a teenager to professional athlete, educator, high school coach and right up to the day of the eventual first-time meeting with his father. o You have a unique story to tell. So, tell it to everyone. o How big is your why, are you equipped? Lock it in. o Become passionate in your new career. Do the extra work. Own it! Are you inspired to make a big decision in your career search? Get into your seven-year-old self and define YOUR why! Technology advancements in job posting boards and Applicant Tracking Systems have hurt the hiring process and alienated qualified people. If you have worked with recruiting/staffing firms but haven’t been thrilled with the results, vCandidates is launching a subscription-based platform in December connecting recruiters with candidates. Becoming a visual, vetted and verified candidate you will experience a streamlined career search process. vCandidates provides a platform to showcase skills and personality while managing interest, interviews and offers within one dashboard. The company will foster open communication, candidate engagement and organization, with platform key features beyond the popular job boards. The candidate can present themselves in their own voice. This new recruiting tool will combine technology with the human touch, including vetted recruiters. Amkor Technology, in business for 50 years, is an innovative global semi-conductor processing company with headquarters in Tempe, AZ. Amkor is 30,000 employees strong across the globe and looking for innovative career seekers. Recognized as a great place to work, with competitive compensation, very attractive benefits and a diverse work environment. The 401k match starts on day one. Thrive on work-life balance for all employees. Amkor has very little employee turnover. Award-winning Amkor Heath Happenings (AHH). Employees are encouraged to improve lifestyle choices by utilizing a fitness tracking device, which can offset medical premium costs. Many, many open positions at all levels. Some positions are created for the right person with unique skills. Current openings include: Wafer Services Director, Design Manager, Flip Chip Product Manager, Billing & Collections Specialist, Sr. Tax Accountant, Sr. Director FCBGA BU, Sr. Director Test Technology, Sr. Financial Analyst, Sr. Manager Internal Audit, Sr. Manager MEMS, Sr. Staff Engineers, Test Technician (internship) and Web Applications Intern. National General Lender Services is a leading provider of mortgage and auto lender-placed protection solutions, insurance products and risk management services. National General serves mortgage lender, mortgage servicers and financial institutions of all sizes, all across the country. Empowering professional environment where all team members are valued for their unique talents and contributions. Extensive internal growth opportunities. Over 100 positions to fill from entry level to management, IT, account executive and claims. “We work for you.” Nesco began in 1956 as an engineering and design firm and has grown steadily over the decades into a national presence in staffing and employment. Serving a wide range of industries through a branch network and national recruiting centers. Ranked as one of the fastest growing US staffing firms. Our next event is Thursday, October 4th at Grand Canyon University when Career Connectors Founder and CEO Jessica Pierce will lead a panel discussion: Boost Your Career Reach by Connecting with Staffing Firms. Attendees are encouraged to submit questions for the panel when registering for the event. 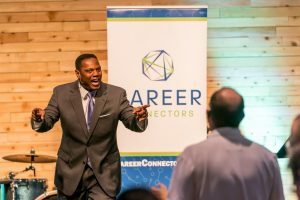 Check the Career Connectors website for the topic and location of each week’s meeting and other resources for job seekers. Thank you to our premier and corporate partners for their continuing support. A special thank you as well to our host facility, Central Christian Church and all of the Career Connectors volunteers.